Although many building committees think of liturgical art as an “add-on” at the end of the project, our experience shows that it is not the best way to think about liturgical art. 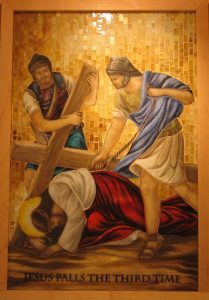 When we sit down at one of the early meetings with our clients for a new or renovated worship or prayer space, we ask them what consideration they have given to liturgical art. Of course, they usually have given some thought to liturgical furnishings, such as the altar, ambo and baptismal font, but rarely have they thought about the many liturgical art pieces that may be part of the final design. Talking about these art pieces early on in the process ensures that the proper environment will be created for these pieces and the money for them will be set aside in the project budget. For custom art, the design and fabrication process can actually be longer than that required for the building, so an early discussion also ensures that the pieces will be ready for the dedication day. When we discuss liturgical art, there are several ways we begin the conversation. The first is to find out how important liturgical art is to the parish. We have seen several responses to this question, ranging from the desire to reuse artwork (including windows and statues) from other buildings to “We’ll let the Art & Environment Committee handle that when the church is finished.” Sometimes the creation of new art designed specifically for the community and the new space is of great importance to them. Regardless of where the conversation starts, we feel it is important to present to the committee the full range of options, along with the advantages and disadvantages of each option. 1. The scale and materials of the artwork can be selected to harmonize with the scale and materials of the worship or devotional space. 2. The artwork can be designed to reflect the cultural identity of the parishioners. 3. The subject of the artwork is not limited to what is available through catalogs. 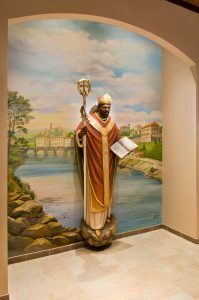 An excellent example of the use of custom-designed liturgical artwork is the Church of the Holy Spirit in Cortlandt Manor, NY – a project for which our firm served as the architect. The pastor was very supportive of original art in the renovated worship space, as he had a deep appreciation for original works of art. 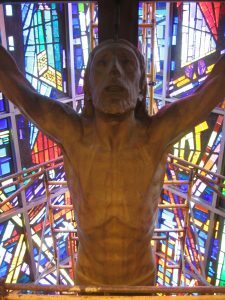 The church hired Artsphere Consulting, LLC, to assist in the commissioning of three separate works of art for the church: a full-scale statue of St. Zeno of Verona; fourteen stations of the cross, crafted from hand-painted stained glass and mosaic tiles; and the interior of the baptismal font basin, also designed in mosaic tile. The pastor wanted a statue of St. Zeno so that the parishioners could learn more about the saint whose relics were contained in the new altar. Artsphere commissioned sculptors in Italy to design and fabricate the statue as well as an artist in New York to paint a contextual backdrop. For the Stations of the Cross, the committee was divided between stock mosaic Stations and sculpted Stations that included more detail than the mosaics. The art consultant suggested a stained glass artist in South Korea that created the perfect solution for them – hand painted stained glass figures, with exquisite detail, set in gold mosaic tiles. The end result gave the committee both the richness some of them were looking for and the detail the others wanted. The same artist also designed the mosaic tiles for the baptismal font. The consultant oversaw the installation of the tiles once they arrived at the church. A primary responsibility of the art consultant was to make sure that all the artwork stayed within the church’s rather modest budget and to provide a bridge between the client and the artists so that the art fulfilled their liturgical goals. Once the church was rededicated, the artwork instantly became a source of great pride for the parishioners. Because they had been involved in the creation of the artwork, it took on even greater significance and importance as sacred art that would enhance their prayer and worship experience, thereby fulfilling the primary goal of all liturgical art. our committee is in process of planning re-furbishing of our church interior. allowing for child immersion and adult by pouring of water. Yes, there are a number of factors that effect the final cost of such a font. The basic shell of the font you mention was $15,000 in 2005. That included the waterproof shell and the equipment to run the font but not any additional plumbing or wiring. It also does not include the marble finish on both the interior and the exterior of the font. In that particular case, the marble was ordered directly from Italy to match the other liturgical furnishings and a special pattern was used, which made it quite expensive. (The tile work was done by the General Contractor so I do not have the cost of that work.) I would be more than happy to work up a quote for you for a similar font. Just use the contact form to contact me with specifics such as size, finish materials, etc. or feel free to call me anytime.